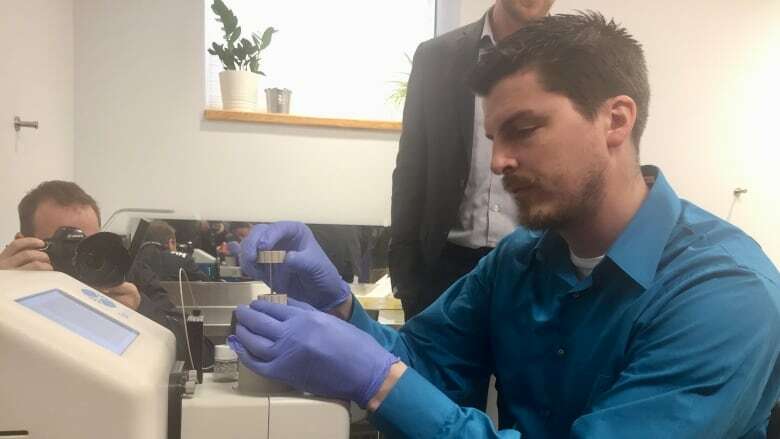 A supervised injection site in Ottawa will be the first facility of its kind in Canada to use state-of-the-art technology to check street drugs for fentanyl, a safeguard experts say could save lives. Carleton University's Karl Wasslen demonstrates how the portable mass spectrometer works at the Sandy Hill Community Health Centre. Staff at the Sandy Hill Community Health Centre (SHCHC) can now use a portable mass spectrometer — a machine that can fit atop a desk — to scan trace amounts of drugs before clients use them. The $160,000 machine can accurately detect potentially deadly chemicals within seconds. Harm reduction advocates say the technology is a potential game changer in their struggle to get the opioid crisis under control. "The use of unregulated drugs of unknown content, quality and effect is driving the unacceptable levels of overdose related deaths and non fatal overdose effects," said Lynne Leonard, an epidemiology professor at the University of Ottawa. Being able to detect dangerous contents will allow health officials to issue "bad drug warnings" and prevent more deaths, Leonard said. It's part of a three-year pilot project involving researchers at the University of Ottawa and Carleton University in partnership with the SHCHC. The project is being funded through a half-million dollar grant from the federal government. Researchers are also hoping to discover whether users will change their behaviour once they find out what's in their drugs. They will log the results from each test and trace results over time. Health Canada's latest figures suggest the number of opioid-related deaths each year in Canada has now surpassed 4,000. In the capital, Ottawa Public Health said 30 per cent of overdose deaths from illegal drugs involves fentanyl. Leonard said there were 327 emergency room visits for overdoses in Ottawa in 2017, and another 58 so far this year. Rob Boyd, director of harm reduction services at SHCHC, said the mass spectrometer drug test won't be mandatory for clients. "People can be reluctant to give up a sample of their product. Even with very, very tiny amounts that we'll take," Boyd said. Clients will be asked whether they want the test performed. If they agree and fentanyl is detected, it will be up to them whether they want to go ahead and consume the drugs, Boyd said. "It's a relationship of mutual trust and it respects the autonomy of people to make choices about their own health," he said. Boyd said staff will continue to intervene with naloxone if an overdose occurs. The test involves dipping a thin metal stick into a drug sample, then placing it into a port in the machine. The spectrometer identifies different compounds by their molecular mass. Results are available within 20 seconds. 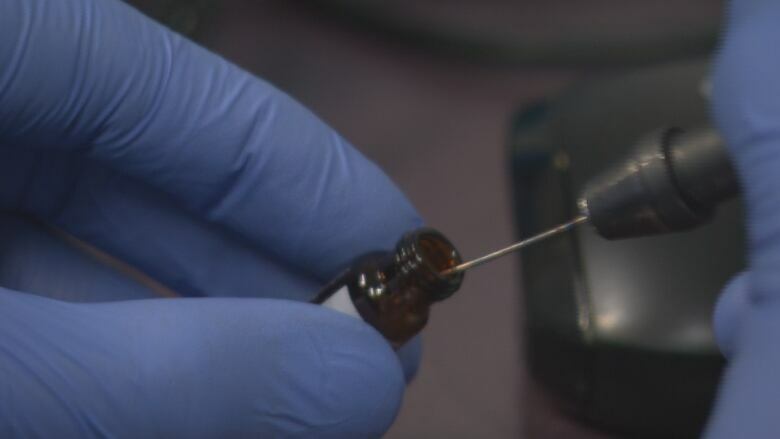 Before acquiring the machine, following an overdose, the SHCHC would send the client's needle to Health Canada's drug analysis laboratory to find out what was in it. It was a process that took months. "We can detect novel substances, things that we don't even know are out there — we can see it. The unregulated [drug] market produces new chemicals all the time. So hopefully we can get ahead of the curve," said Carleton professor Jeffrey Smith, who's in charge of training workers to use the spectrometer. Starr, 38, who uses heroin, said she would agree to get her drugs tested. 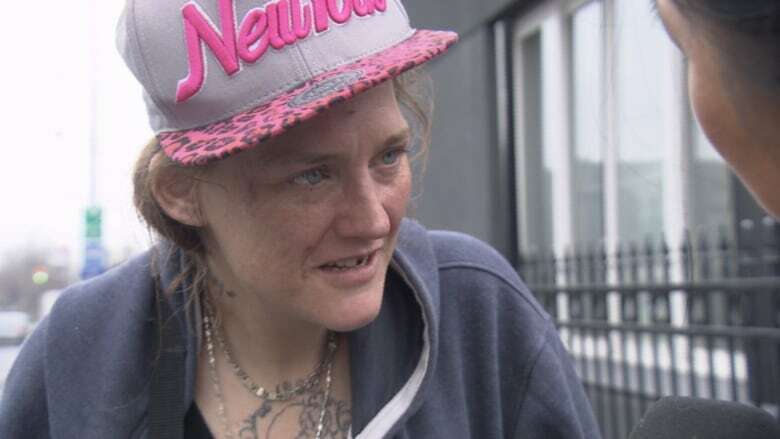 Starr, who said she's 38 but didn't want to give her last name, said she's been addicted to heroin for nearly 15 years and visits a supervised injection site at least five times a day. She said she's been "traumatized" by the deaths of friends who overdosed. When shown a video by CBC demonstrating how the spectrometer works, Starr got excited and asked where she could get her drugs checked. "[This] will probably stop me from overdosing, and other people from overdosing," she said. But asked whether a positive test result would cause her to throw away her drugs, she hesitated. "I wouldn't use, unless I was severely dope sick," she said.